I went to the fireworks on Saturday, which are a bit of a pain – I’m not big on sitting on the ground, as it usually results in injury causing numbness. But I went for two reasons – to see friends I haven’t seen in awhile, and to have a Fat Burger. I don’t often eat Fat Burger, but do enjoy them. Until Vancouver gets an In & Out (and what are the chances of that? ), I enjoy a yearly Fat Burger treat. Only, they close at 9 on Fireworks night. Which means that at quarter to, they lock the doors. Which means that at ten to, I’m pissed off. If I can’t come through your door and order, you ain’t open. Your sign, it lies. 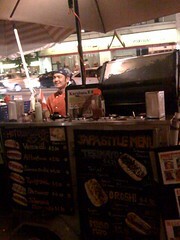 Grumpy, I slog through the evening, but later one of those aforementioned friends suggests I try Japadog. It is, any way you look at it, a hotdog stand. It makes all the normal varieties of hotdog stand hotdogs – but what makes it are it’s “Japa Style” specials, which are all beef hotdogs made with Miso Mayo, Teriyaki Mayo, or Oroshi dog, which has radish on it. You wouldn’t think it, but it’s got a nice bite to it. Corner of Burrard and Haro (just outside the Sutton Place Hotel – you can imagine the number of famous faces they’ve racked up), if you’re still into hotdog (and I know some aren’t), you might want to consider this breath of hotdoggy air. Besides, how many hot dog stands have websites? That’s can’t be a long list.